There are plenty of statistics that will support the fact that companies with a great customer experience will outlast ones that don’t. In fact, research suggests that 86% of customers are willing to pay up to 25% more to get a better customer experience so providing good customer service shouldn’t be something we need to convince you that you need to do! But just how do you keep your customer service/call centre team inspired to provide great service? 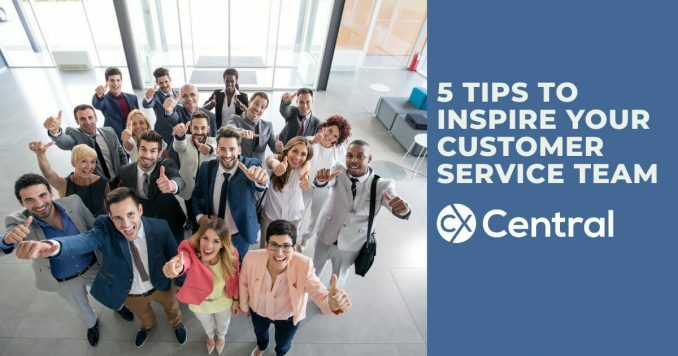 A recent blog by Live Chat software provider, Provide Support shares five tips that will help you to inspire your customer service team and improve your employee’s performance. Great and fresh ideas are the best contribution to any business. Do not take such ideas for granted, reward your employees for them. Otherwise, they will contribute to your competitors. If your employees think out-of-box, offer them a bonus and they will come up with more creative ways of improving your business. Promote better creativity and cooperation within your team, let your co-workers put their ideas forward and you will see an immediate positive effect of regular brainstorming. If your employees unleash their potential, they will solve issues with creativity and will provide exceptional service to your customers. A stressful and depressive environment does not give your employees the mood to think of doing things differently. They will just look forward to the end of the day. On the other hand, if you create an easy-going atmosphere in your office, you will be rewarded with wonderful ideas your co-workers contribute. As I have already mentioned a positive working environment encourages team members to contribute great ideas and think out-of-box. If you are not afraid of experiments and new fresh look, let your employees introduce their ideas. Choose the best ones and implement. Youve got to start with the customer experience and work back toward the technology  not the other way around. Thats what Steve Jobs used to say about customer experience. His presentations inspire and encourage to think out-of-box. Organise discussions of customer service best practices on a regular basis. People want to know that their employers understand them and their aptitudes. Those leaders who took time to know their teams better, create the right environment for them and motivate will be rewarded with better performance and gratitude. In customer service, a positive atmosphere is very important. A smiling team will provide a memorable customer experience. And this, in turn, will help to win more loyal customers who will not only return for repeated purchases but will also share their positive experience among their friends and in social media. This is not only the way you treat your customers. Customer service culture covers the whole process of customer service. It’s not just about hiring the right people and their training. Customer service culture is about understanding the companys goals where excellent customer service is set as the main priority. Customer focused culture begins with people who want to serve your customers right and who understand your companys goals and mission. Daily line-ups will help you to keep your company culture alive and will also let your team discuss the main challenges and share best practices.